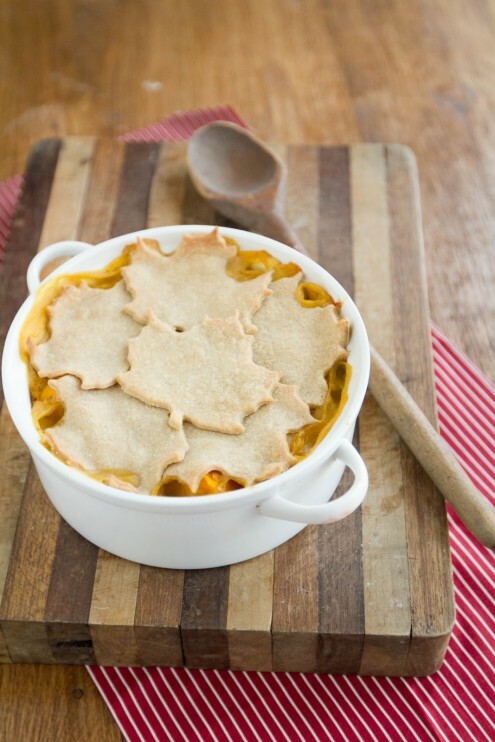 Butternut Squash and Lentil Pot Pie | Naturally. Food is linked to many memories in my life. While I didn’t always eat homemade food when I was young, the link is still there. I’ve said this before but I was (and am) extremely fortunate. I didn’t grow up going to a “babysitter” in the traditional sense but instead I always hung out with my grandparents. While my grandparents fed me what I wanted (McDonald’s- a sad byproduct of being a misinformed child of the nineties) there would be the rare time they would put their foot down and cook something. Sure, the pot pies they cooked were frozen and sure, the pot pie probably had the same about of crap as the McDonald’s meal had; however, the experience was not the same. I, being the impatient person I am, would stake out in front of the oven. The smells wafting from the oven always caught me by surprise and the anticipation made the first bite that much better. When I started eating vegetarian, I pretty much ruled out pot pies. I mean, the pot pies I always ate were chicken based and without the chicken I’d be eating peas, carrots, and potatoes. I attempted to make vegetarian pot pie which was good but not drool worthy. What I missed was the creamy texture and the intoxicating aroma coming from my oven. This pot pie has everything I was searching for and more. I get the creamy texture, the chunks of veggies, the intoxicating aroma, and more over: it’s healthy. The filling is actually vegan and made creamy by the lentils. 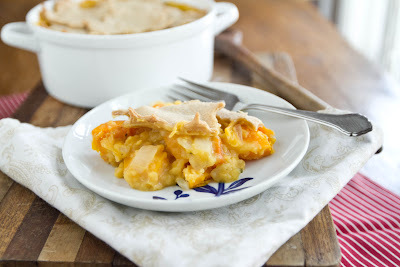 I think I found my new winter comfort food! In a food processor (or a medium bowl) combine flour and salt for crust. Pulse (or cut) in butter. Once butter is mostly into small chunks, pulse (or cut) in cream cheese. Once butter and cream cheese are in pea size pieces, pulse in 1/4 cup of water until dough begins to come together (adding a 1 tablespoon of water extra as needed.) Remove from food processor and shape into a disc (without handling the dough too much.) Wrap in plastic and place in refrigerator. Combine lentils and 2 cups of water together in a pot. Bring to a boil, reduce to a simmer and let cook until lentils have softened and most of the water has been soaked up. Set aside. In another pot, heat olive oil of medium-low. Cook onions until they become fragrant and translucent, about 4-5 minutes. Stir in butternut squash and continue to cook for five more minutes or until butternut squash begins to soften. Next, add in rosemary and flour, stirring so that the flour covers the butternut squash and onion mixture. On a floured surface, roll out dough and you can use the dough as is and crimp it over the entire pot pie. The dough can also be cut with cookie cutters and places on top of the pot pie. Brush pie crust with olive oil and bake for 25-30 minutes or until the crust is golden brown and the filling is bubbling. This looks heartwarmingly yummy. I love the idea of pairing butternut squash and lentils. I think it is a combo I am going to try more often. I’m just starting to use lentils and I already love them! This looks really amazing. I have some lentils hanging out in the cupboard that I’d like to use up sometime soon, too. Love the leaves! =) Thanks for this one. This was fantastic! I added about a 1/2 tsp more of rosemary and made the crust with vegan butter and cream cheese. I would even experiment with adding cinnamon or other spices to the crust. Also, we found it could serve four people easily if a salad or other side is included in the meal. Thank you for the wonderful recipe; I can’t wait to make it again! I made this tonight- how lovely! I followed the recipe pretty closely- something I rarely do. The crust was great- a perfect pairing to the savory center. I do think that you could easily take a lot of liberties and have this turn out phenomenally, I’ve already got some ideas hatching. 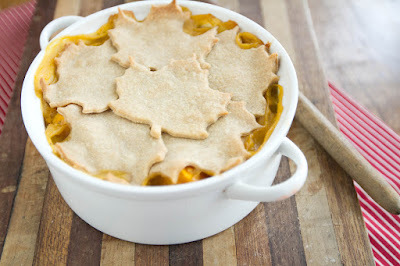 I can guarantee that I will be experimenting more with pot pies in the near future. I also made extras to freeze for another day. I covered and froze them uncooked (but assembled). Thanks for this recipe! mine never boiled, but it was good. i just made this last night for my and my boyfriend and it was SO GOOD! it really does taste like a comfort food pot pie, somehow not totally like either squash or lentils. i didn’t have rosemary so i used thyme and it tasted great. This is a little misleading as the filling is vegan, but the pot pie is not. Are there any recommendations on how to make the pot pie vegan? What a fabulous recipe! I’m writing it down for safekeeping as we speak. I was avoiding a run to the store, so I substituted the squash for one sweet potato and three large carrots. I also used green lentils instead of red, so I didn’t end up with the same appetizing color, but it was delicious nonetheless! Even my meat-eating boyfriend has already requested I make this again. Thank you for sharing! This looks so delicious. 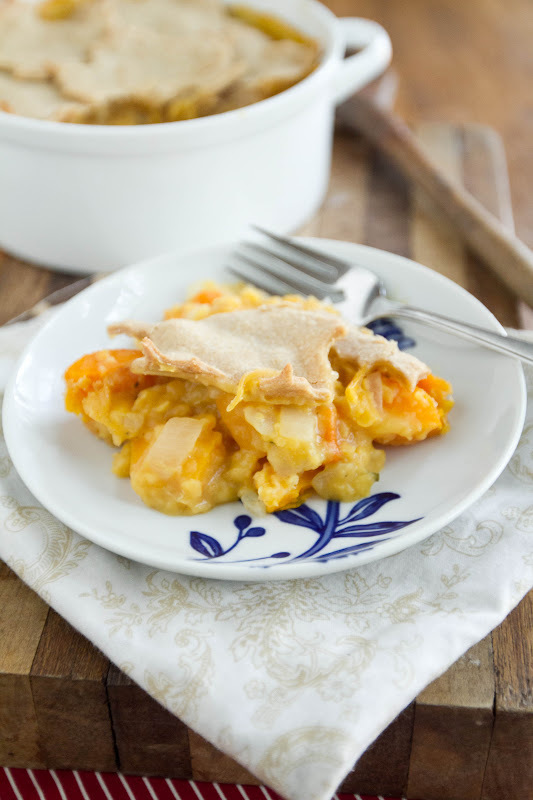 I haven’t seen many veggie pot pies around and I love that you’re using such healthful, filling ingredients. I’m definitely going to save this recipe! Made this tonight. It was amazing. I added some diced celery and frozen peas. Can you make this ahead of time and then bake it off when you are ready to eat? Yes- I think this would be a great meal to make ahead, freeze, and then bake when needed! Do you think this could be made with regular white flour instead of whole wheat pastry flour? Yes- it subs the same! I veganized this using earth balance and toffutti cream cheese. It was so yummy, I added a little earth balance to the broth and used 1/2 c white wheat flour, 1.4 cup white bread flour. It was the flakiest crust I’ve ever made. It made three crockpots servings. I make this for my family every year for thanksgiving. It is so good! Made this tonight (added peas) and it was DELICIOUS! I’ve made this twice now, and I really like it! Very wholesome, savory dinner for a chilly night. The biggest flavor character is the rosemary. I may use less than a teaspoon, next time. It overwhelmed the other flavors, a bit, in my pie. Adding a dab more wine did not change the consistency, and I LOVED using all butter in the crust (I was out of cream cheese). It’s an amazing crust…even my non-whole wheat friends enjoyed it. Thanks for the delicious recipe. It’s been a staple this winter, in our house! Just made this tonight, it was great! Very filling. I used homemade chicken stock instead of veggie, but otherwise followed the recipe. Yum! This is a family favorite and we have been making it for birthdays and holidays ever since I found your recipe! Will be making it again today- Thanks!!! Made this tonight and it was scrumptious! I didn’t have enough BNS so supplemented with sweet potato. I also added a spoonful of cashew nut butter for extra creamy/comfort factor. The pastry was beautiful. This recipe is going to be a regular feature at mealtimes this winter. Thank you, Erin!